Published on December 17, 2018 in Allenatori, Calcio, Generale and Giovani. 0 Comments Tags: Primavera, professionisti, Serie A, stranieri. Published on May 22, 2017 in Allenatori, Calcio and Generale. 0 Comments Tags: Allegri, Ancelotti, Bayern, campionato, Capello, Chelsea, Conte, Juventus, Lippi, Real Madrid, Serie A, Trapattoni. 20 years ago Marcello Lippi, Fabio Capello e Giovanni Trapattoni won the football championship in Italy (Juventus), Spain (Real Madrid) and Germany (Bayern di Monaco). This year the winning triplete is for di Massimiliano Allegri (Juventus), Antonio Conte (Chelsea) and Carlo Ancelotti (Bayern di Monaco). Published on January 13, 2014 in Allenatori and Calcio. 0 Comments Tags: retrocessione, Serie A. Easy to talk about Juventus winning mentality, its record and what it can still be done in Serie A second half championship. Equally easy to talk about the positive results of Roma and Napoli chasing a considerable distance but they are still in second and third place with an average points significantly higher than that of the previous season. It is more difficult to understand/know how the 7 teams with from 12 to 7 to 8 losses and 2 draws will go into the pitch. With which will these teams start the matches knowing that they have lost half of the games? At this regard tonight it will be played Sampdoria (18 points and 8 defeats) Udinese (20 points and 10 defeats ): will they play to win or not to lose ? This year, these 7 teams have ever lost against the top in the standings, so the only hope of staying in Serie A lies in matches with the direct opponents. But a team that usually loses and draws will be able to play a few but decisive matches with a winning attitude? Finally, journalists say that they could save with less than 40 points, then these teams will have to get more points in the championship second half than in the first. For who will be impossible ? Published on August 26, 2013 in Allenatori, Calcio, Mental coaching and Stress. 0 Comments Tags: Calcio, campionato, fatica, mentalità, Reti, Serie A. The results of a study that I conducted on three Serie A championships showed that the last half hour of play is not only the period in which they are made ​​scored more goals (68% of the total) but it is also the phase where 44.2% of goals are decisive for the final result. In contrast, only 16.3% of decisive goals are carried out in the first half. In this first day of this football season (still waiting for the today last game ), this data is only partially confirmed. In fact, out of 19 marked, 7 goals are in the period between 61 and 75 minutes and only 1 in the last quarter of the second time. At present these data gives only what it has happened in the first championship day but in the course of the year they will be taken into account, to see if there will be a change in the teams in terms of mentality and physical preparation to reduce the percentage of the decisive goals scored in the final period of the match, goals that as we approach the end of the game and the physical and mental fatigue are increased are more difficult to recover. Published on August 23, 2013 in Allenatori, Calcio, Mental coaching and Stress. 0 Comments Tags: aggressività, allenatori, calciatori, Calcio, campionato, emozioni, presidenti, rispetto, Serie A, stress. It starts a new football season, this year even more important because it will end with the World Cup in Brazil. There is therefore a further reason for the players to want to play your best, with the aim to be among the 22-man squad for the World Cup in South America. In any event, each team will have its goal to be achieved: for some will not go back, for others to get into the UEFA or confirm the result of the previous season, for others it will be to win the championship or play the Champions League. Beyond the technical and tactical level possessed, each team will show its value only if the players on the field, the bench, the coach and the president will demonstrate a high level of emotional control. The management of the competitive stress affects everyone, without exception. In Italy we were often champions of stress. We have the record of coaches fired during the championship by presidents who can not contain their fears or their wounded narcissism also by a few negative results. We are also a League where the players make too many fouls and it is not true that the players would not be able to avoid them, because when they play at the European level they did less. In Italy they feel free to not respect the rules, protected by fans, coaches and presidents always ready to blame the referees, to talk about a conspiracy against their team or to not have understood that football permit the physical contrasts. The coaches knowing that half of them during the championship will be probably fired risk to live in a dramatic way the negative results of their team, for many it is a temporary job, certainly very well paid, but risky as climbing an eight thousand knowing the number of victims it kills every year. Despite these uncertainties, however, it’s absolutely necessary that the protagonists of football know to keep a cool head, reminding themselves the team’s objectives and how to achieve them. Self-control, effective stress management, aggression loyal and respectful of the opponents must be the basis of the behavior on the field, in other words it means knowing how to manage the emotions in a context, the match, which itself is a highly emotional situation. Therefore the teams have to live for 90 minutes this mental condition showing able to manage it effectively. This is in my opinion the challenge that each team must prepare to face and win each match, as well as the final result. Published on August 14, 2013 in Allenatori, Calcio, Giovani and Stress. 0 Comments Tags: Calcio, club, coppe europee, giocatori, Serie A, stranieri. Italy is not a country for young people also in that particular job field that is football. According to the data of the Association of Italian football player in the 1999-2000 season were registered 249 foreigners; in 2002-2003, 535; in 2007-2008, 846 (percentage in Premier League of foreigners /Italian 38.72%); in 2009-2010, 1032 (in percentage foreigners/Italian 40.24%); in 2011-2012, 47.82%; in 2012-2013, 50.26%, for a total in Premier League of 774 players. Therefore for the first time more foreigners than Italians. In essence among those who, after many selections, could play in Premier League only one out of two will make that happens, because the excluded will be replaced by a foreigner. It ‘s another example of a nation that does not invest in young people and that for these choices is likely to fail. In fact, it can be said with certainty that from school, university to soccer there are not investments in human, financial and organizational resources to reverse this trend. What psychological effect determines this culture: year after year it shows that there are insuperable limits, that professional competence and determination to succeed are not decisive, and that you will be chosen on the basis of financial decisions that have nothing to do with the sport success. This is so true that in the last years the club well padded of foreigners have not reached any success in the European Cups. Published on January 7, 2013 in Allenatori and Calcio. 0 Comments Tags: Calcio, Serie A. The knowledge of what is the best mentality with which to start the match is a crucial input for each coach and the team. It’s important to know that the players need to be confident and combative and this is what constitutes a winning mentality. But there is one factor that is less talked about, and that supports this kind of mentality, is to know to what result you get into the field. 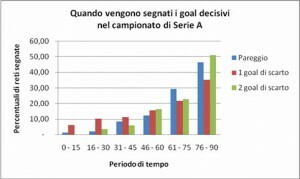 Based on these ideas I want to analyze the results of the first half of the Italian football championship. The first teams in the ranking – Who wants to win the championship must play to win every game. In fact, it is better to win two games and losing one (6 points) rather than to win a match and stack it two (5 points). Between Lazio and Fiorentina there are four points, despite having lost the same number of matches. But Fiorentina have made ​​2 draws in more than Lazio. Inter have the same points of Fiorentina despite having lost two games more, because it won one more game and has 3 draw less. So who’s at the top shows its winning mentality playing to win every game, because draw provides no advantage. Juventus is in the lead because it has won more games and has matched less than the others. The latest teams ranked – Who does not want to move back to Serie B instead should stack it about half (about 9), losing about 60% of the others and win the rest. The best example in this league is Torino: drew 9 games, lost 6 and won 4. Who has lost more than half of the games is forced to cut ties and compensate with a greater number of victories. For the latest teams ranked winning mentality means therefore get 50% of draws and 20% of wins. (Siena is the last one because has started the season by -6 points, Torino and Sampdoria had -1 point, Atalanta -2 points)). Published on December 22, 2011 in Generale. 0 Comments Tags: campionato calcio, Inter, Juvetus, Milan, Serie A, Udinese. Published on December 20, 2011 in Generale. 0 Comments Tags: Calcio, carattere, Serie A. 1. Il Palermo continua a perdere in trasferta ma peggio ancora non ha ancora fatto un goal. 2. La Juve continua con cattiveria a vincere. 3. La Roma comincia a mettere in pratica gli insegnamenti del nuovo allenatore a dimostrazione che ci vuole tempo per cambiare mentalità di gioco e non basta affatto essere dei professionisti, serve capire, agire e memorizzare. 4. Praticando il concetto “primo non prenderle” l’Inter procede e per il gioco c’è tempo. Cambiamento di mentalità anche per questa squadra, anche se diverso rispetto alla Roma, che sta avendo l’umiltà di togliersi dalla testa il recente felice passato e buttarsi nell’agone come una qualsiasi. 5. Il Parma ha giocato come una squadra inglese, con la convinzione di riuscire a cambiare il risultato negativo e questa volta c’è riuscito. E’ importante mostrare questo atteggiamento mentale perché la maggior parte dei goal decisivi vengono messi a segno negli ultimi 15 minuti (+ recupero) delle partite. 7. A Cavani non è sfiorita l’ispirazione e Cavani non divora le occasioni, piuttosto dovrebbero maturare mentalmente e allenarsi per avere sempre lo stesso atteggiamento in campo.